What does this Farage wants exactly? Does he wants the fall of the EU ? Or he doesn't want to see foreigners again in the UK? Who told Farage that you aren't safe in your city? Who told Farage that what happened in 2016 is a global revolution? Brexit and Trump is not a global revolution, because only half of the Britain population wants Brexit and only belongs to the United Kingdom, not the world, and more than half of the American population do not want Trump. So how is it a global revolution.? It must be a bad revolution if it is a revolution. This is misleading. It's not good to hear such things from someone who is part of the country's leadership. Breathing is a risk, eating is a risk. Everything about life and this world are risky.. So, what are we talking about? What if you sleep and you don't wake up? Are you going to relate it to terrorism? Farage is one of those people who created fears amongst people. He misled people. He made people started having discrimination mentality and made people to hate more, he made some people to become racists.. Trump took it from where Farage stopped. The Westerns must be blame for the act of terrorism happening now, those middle east/Muslims nations were quiet and good nations before United States and United Kingdom started war in those countries. They started the war, they promised the middle east to take those kids, they promised them to take care of their kids and now planning to abandon those kids after they have totally destroyed their countries. ISIS and other terrorist gangs arose after West destroyed their countries only because of oil and gold. Breaking up or tearing apart or blocking some countries from coming into your country or discriminating some countries, discriminating some races, some tribes or religions, standard of living will not put an end to the terrorism facing the world right now. World needs to come together to solve this problem instead of destroying what they've set up long time ago. Farage and Trump are one of those humans who discriminates and wants break up. 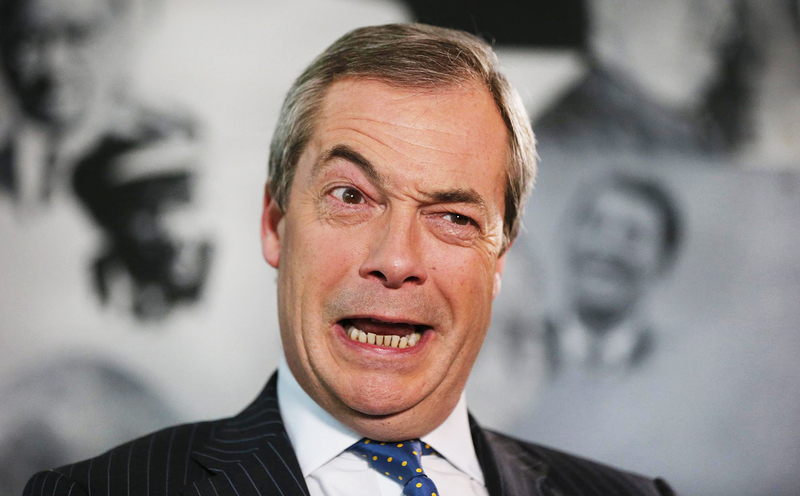 Nigel Farage is a leader in the United Kingdom, because anybody who leads a group or some organizations or set up an activist organization is a leader. How do the British heard Farage if he is not a leader? You don't have to be a politician until you see yourself a leader. It is either you be a good leader or a bad leader.